The quarter of the year is almost over and done with! After over eighty hours of travel, ten flights and three cities later, I finally curated seven of my holy grail skincare products that work so well with my skin. My skin has been nothing but dry, dull and uneven so I gravitated towards products that give me the perfect amount of hydration and radiance (and is TSA approved.) For the last three months, I've consistently used the same seven products on (and off) the airplane to let it really work on my skin. I learned that investing in quality skincare products makes for quality results. This is my in-flight skincare and I am so happy to finally share it with you. One thing you should know about me is that I refuse to travel with make-up on my face. Not even an ounce of foundation goes on, not even my go-to winged liner. If that doesn't tell you how much I love skincare more than make-up, I don't know what will. 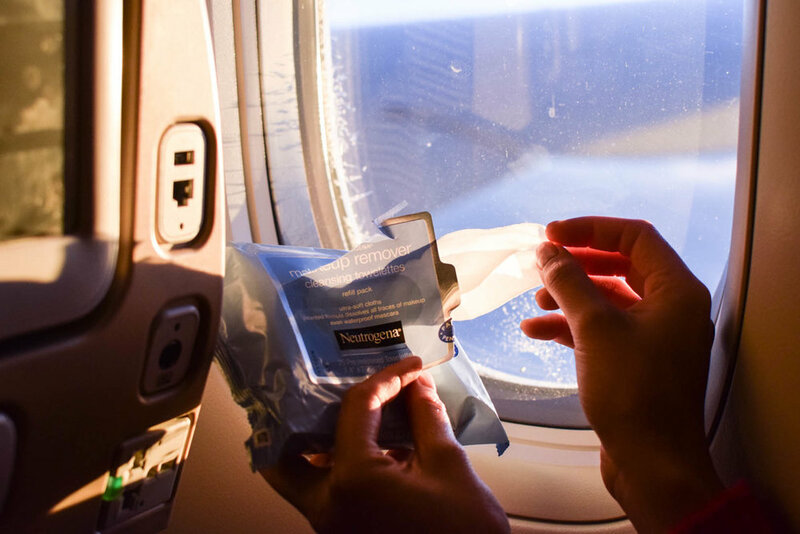 But even with zero make-up, my skin still always feel dry and dirty on airplanes so these cleansing towelettes by Neutrogena is handy in my purse. I wipe these on my bare face and feel fresh already. I first heard about SK-II two years ago. I have been hesitant to spend so much money on skincare. So as a start, I purchased the three in one set that included the lotion, the essence and the facemask. Now, I fully trust it and would invest on the full bottles as soon as I run out. This clarifying lotion is the perfect on the go exfoliator after cleansing. It removes the excess dirt and dead skin. I usually soak a cotton ball and wipe it all over my face concentrating more around my mouth and the sides of my nose. After application, my skin instantly feels smoother and more hydrated. After exfoliating, I love a good face mask. Yes, I am one of those crazy people who put a face mask on the plane to scare the people sitting next to me. The circulated air in planes really dries out my skin so a really good face mask is a must! If by any chance, I forget to bring any of my other skincare products, I'll always have a face mask handy. I can't quite link this specific one that's pictured so I've linked a few below. After a good face mask, I apply the SK-II Facial Treatment Essence all over my face concentrating more on my cheeks. I have really big pores and somehow it gets even bigger inside the plane. This essence refines the look of my pores for a smoother skin texture. My skin feels firmer after applying this. I don't know why I went this long without this concentrated, corrective Vitamin C serum in my skincare routine. This serum rescued my skin from uneven pigmentation and dull skin. Whether I am off or on a plane, I apply one or two pumps of this stuff onto my palm, and apply it all over my skin. After using it for the last three months, I don't think I can go without it again. After my serum, I love applying this ultra-lightweight hydro gel-cream by Dr. Jart. The formula instantly cools and refreshes the skin while giving it a boost of hydration. A little goes a long way. After application, I wait a few minutes to completely absorb onto my skin creating this sheet of cushion to hydrate and energize the skin. After the gel-cream, I love applying this hydro sleep mask especially if I have a red-eye flight. I make sure to apply this before I sleep on the plane. Again, a little goes a long way. This stuff balances the moisture in my skin and boosts firmness. It creates a protective barrier on my skin to lock in the moisture and nutrients I need while I get my beauty sleep. When I wake up the next day, I simply wash it off with warm water. My skin just feels so healthy and soft when I wake up! Let me know if you also use any of these products or if you're willing to try any of them.